A Chinstrap penguin chick (Pygoscelis antarctica), in creche phase, waits in the muddy mess of the colony for its parent to return with a meal. They can withstand most weather extremes in their warm, downy coats. It is slowly shedding its fluffy chick feathers for more robust adult feathers, which will allow it to eventually graduate to adulthood and hunting its own food at sea. Long before you see a penguin colony, you can hear it. Whether you approach overland on foot, or from the sea, the effect is the same. A wave of cackles, honks and shrill bleats can be heard a great distance away. But long before you hear a penguin colony you will smell it – a sharp, acrid, ammonia-tinged smell that is unmistakable. It grabs your attention and gives you a little jolt, much like smelling salts, if you’ve ever had the misfortune. That pungent, powerful aroma is all because of the poo. Lots and lots of penguin poo. On little Signy Island, we have over 70,000 little poo machines. Stick around and I’ll tell you all about it. The big, dirty feet of an Adelie penguin fledgeling (Pygoscelis adeliae), soon to go out to the sea. If you have a romantic image of a penguin’s clean life in the white virgin snow, from shows like Pingu, The March of the Penguins or any of the BBC Natural History Unit’s incredible documentaries, you are in for a surprise here. You have been sold a false image for most of the penguins in Antarctica. The snow in the vicinity of a penguin colony doesn’t stay white for very long after it falls. Most Antarctic penguin colonies are muddy, guano-saturated stink fests. In fact, the penguins themselves frequently become guano-covered stink bombs. In our work with the penguins, we often become guano-covered stink bombs too. Why am I telling you this, you ask? Well this is the first episode of my attempt at a blog. I wanted to start off with a bit of a bang. And I wanted to convey the impression that what goes on in Antarctica is not always pretty or what you see on the TV or in the movies. There’s a lot more going on than meets the eye (or the nose). And those are the unique stories I want to share. 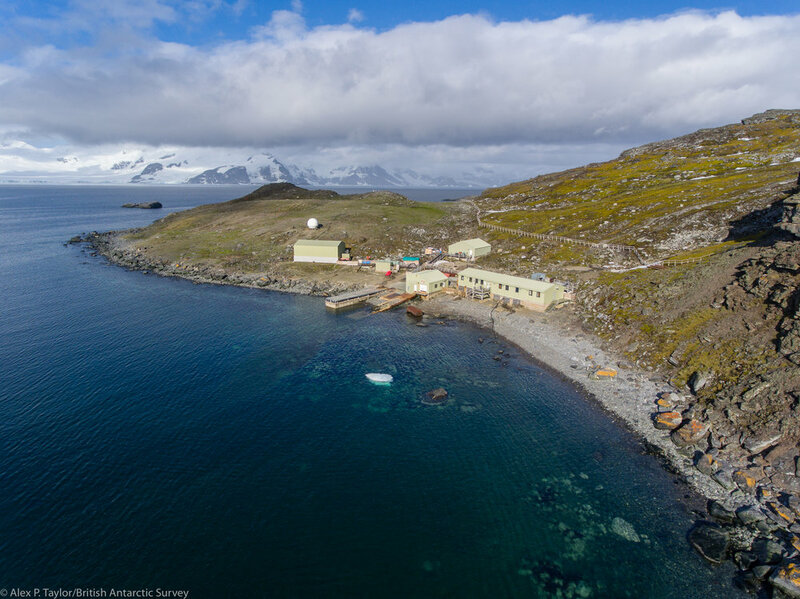 An aerial view of Factory Cove and Signy research Station on Signy Island, Antarctica. Coronation Island can be seen in the distance, across Borge Bay. A British science presence has been doing research on the island since the mid 1940's. Whalers used the site decades before that. The prominent fence running across the base of the slope keeps the nearly extinct, but now booming, fur seal population from destroying the delicate moss banks beyond. Because there is so little unglaciated, habitable shoreline or land in the Antarctic, places like South Georgia and Signy Island become refuges from the sea for the wildlife. Signy is a little oasis in the middle of this huge, cold sea; a tiny needle in the haystack of the Southern Ocean. For hundreds and thousands of kilometers in most directions there is just sea. The wildlife rock up here en mass from thousands of kilometers around to rest and breed in the short Austral summer. Signy is the oasis for three species of penguin; elephant seals and fur seals; giant petrels, snow petrels and many other birds. Signy, therefore, is an excellent place to study the flora and fauna of the Antarctic and monitor the changes occurring in the ecosystem. Here the environmental sciences are king. Most of the research centres around long term monitoring of the sea bird species that use the island as a summer home to breed and moult. Most of that work is focused on the penguins. Yes, it is my job to work with penguins. And I love it. Even if it is very stinky. All three main penguin species of Marine Antarctica, members of the "Brushtailed" group of penguins, can be found on Signy Island in the South Orkney archipelago: (L-R) Adelie (Pygoscelis adeliae), Gentoo (Pygoscelis papua) and Chinstrap (Pygoscelis antarctica). This blog has been a very long time in consideration and even longer in bringing it to fruition. The idea has been trapped in anti-gravity of procrastination and a busy life. Family and friends have been suggesting for a long time that I write a blog and distribute my images to a wider audience. I respond, with a head nod, “Yeah, I know…any day now…” Then life and work consume all the hours in the day and weeks turn into months and…I think you know the rest. Now, in service to the encouragement of all my friends, family and colleagues, I am finally pulling it off and launching this thing. I hope the unique stories and images that come out of this incredible place will entertain, amuse and possibly even educate. The posts will vary in length and frequency. Satellite bandwidth not with standing, I hope the blog will be rich with visuals to illustrate the stories or simply to stand on their own. Eventually a video clip or two will get posted. I will be spinning yarns about penguin poo, two-ton seal monsters at our doorstep, the furious weather, the science and what human life is like in this little corner of Antarctica. Alex Taylor in the Antarctic with the British Antarctic Survey. I am happy to finally get this thing off the ground and I hope you come along for the journey…a walk on the wild side. Next post – more about penguin poo!